Last Friday we turned 2! Our sophomore year was a good one. It was the year I finally found my voice as a blogger and the year I met so many wonderful people in this sphere of the internet. I wouldn't change a thing. But if I had one desire for the upcoming year, it would be to post more regularly. I love interacting with all of you and hope we can do it more often. This blog has shown me a range of emotions I didn't think was possible. Back in high school, I threw some shade at a guy for reasons which elude me now. He responded with, "Summer, if someone had a warm soda, I would tell them to chip some ice off of your heart because you are just that cold." I deserved it. I respected him a little more after that because it was true, I have always been reserved, quiet, an observer, and a bit cold if we're to be completely honest. I never anticipated the sheer joy of moments such as publishing a post I'm incredibly proud of, being nominated for an award, partaking in workshops with like minded people (talking shop for hours! ), and running into new blog friends by happenstance on the train. Conversely, I was also entirely ill equipped to deal with the uncontrollable outbursts of rage when recipes fail after 5, 6, 7 tries, the woeful despair of having a great recipe but not being able to translate that into photos, the pointless frustration toward the sun in winter. All those ups and downs are what got O&O here today. Of course we also wouldn't be here without the support of all you wonderful people. So to celebrate such a momentous occasion, we need a cake that is equally memorable. Only recently have I come to embrace black sesame as a real ingredient rather than a sushi garnish. On our recent trip to China, we had the pleasure of celebrating the Lantern Festival, marking the end of two weeks of new year's celebrations. Traditionally, everyone eats something called tangyuan, which are glutinous rice balls usually filled with something sweet like a black sesame sugar. Eating them gives you luck and with the amount I ate, I should have good luck for the remainder of the year and perhaps beyond. It's. so. good. Black sesame has an earthy, nutty aroma and pairs with the fresh tartness of citrus beautifully. Cake ended up being the perfect vessel to present all of those flavors, but I'm still on the lookout for other ways to use my new favorite ingredient. Hope you guys enjoy! Makes one 6 layer 6 inch cake. Depending on how citrusy you'd like your cake, you might have some curd leftover. Store any remainder in an airtight container in the fridge. I would keep it for two weeks max. If not serving the cake immediately, you can keep it in the fridge until ready. The buttercream will become quite stiff when cold so let the cake rest at room temperature for 20 to 30 minutes before serving. Preheat oven to 350 degrees F. Grease three 6 inch cake pans and line the bottoms with parchment paper. Blend the black sesame seeds and 1/4 cup of granulated sugar in a food processor until finely ground. In a medium mixing bowl, add cake flour, baking powder, baking soda, and salt. Whisk to combine. In the bowl of a stand mixer fitted with the whisk attachment, whip egg whites on medium speed until soft peaks form. Then with the mixer still on, start adding in 1/4 cup of granulated sugar one tablespoon at a time. Keep mixing until stiff peaks form. Transfer whipped egg whites to a clean bowl. In the same stand mixer bowl, this time fitted with the paddle attachment, beat butter and remaining 1/2 cup sugar on medium high speed until light and fluffy, 3 to 4 minutes. Scrape down the bowl, and add egg yolks and vanilla. Beat for another minute until smooth. Scrape the bowl again and add black sesame sugar and buttermilk. Beat for another 2 minutes, starting on low then turning the speed up to medium to prevent splattering. Add the flour mixture in two additions, each time mixing until just combined. Gently fold the egg white into the batter until no streaks remain. Split the cake batter evenly between the three cake pans and bake at 350 degrees F for 25 minutes or until a skewer inserted in the middle comes out clean. Let the cakes cool for 15 minutes before unmolding them. Once the cakes are at room temperature, wrap them tightly in plastic wrap and freeze until firm but not completely frozen, 1 to 2 hours. Combine the grapefruit and lemon juices in a saucepan. Simmer until reduced by about half, 12 to 15 minutes. Transfer to a liquid measuring cup, add the grapefruit zest and let the juice cool for 30 minutes. In the same saucepan, whisk together sugar, egg yolks, and whole egg. Add the reduced citrus juice and whisk again to combine. Place the pan over low heat and cook, whisking frequently until the mixture thickens and a few large bubbles break the surface. Immediately remove from heat, add butter, and stir until melted. Strain the curd through a fine mesh sieve, transfer to an airtight container and refrigerate until completely chilled, about 2 hours. Combine egg whites and sugar in a heatproof bowl. Place the bowl over a small saucepan of simmering water and heat until the sugar has completely dissolved. Transfer mixture to the bowl of a stand mixer fitted with the whisk attachment. Mix on medium speed until stiff peaks form. Then with the mixer still on, start adding butter one tablespoon at a time. At some point, your frosting will look like a curdled mess, but keep mixing and it will turn smooth and silky within a few minutes. Once the buttercream has come together, add 1/3 cup of the chilled citrus curd and keep blending until smooth. Take the cakes out of the freezer. If they are too firm, let them soften at room temperature until you can slice them with ease. 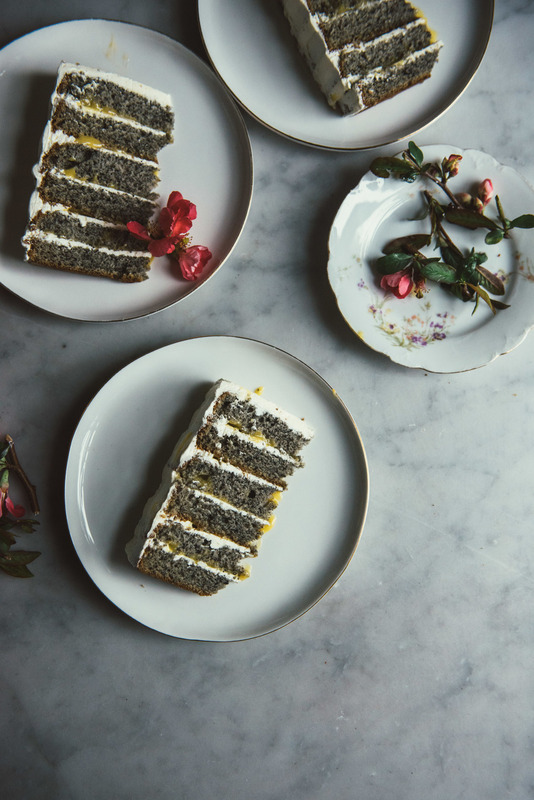 Using a sharp serrated knife, level the cakes then split them in half—you should have six layers. Place the first layer on a cake round and spread a thin layer of buttercream on top. Pipe a ring of buttercream around the edge, then spread a thin layer of curd inside the ring. Place the next layer of cake on top and repeat the process until you have assembled all the pieces. Frost the outside of the cake with the remainder of the buttercream. Enjoy!